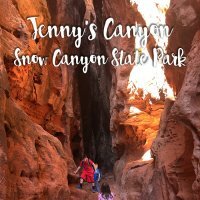 Jenny’s Canyon in Snow Canyon State Park is a very quick and very fun trail for the entire family. 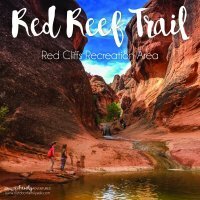 A great hike for kids! 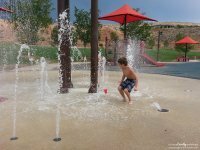 Snow Canyon State Park offers a lot of shorter trails that aren’t too difficult for the little ones. 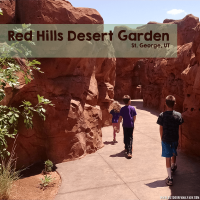 We especially liked Jenny’s Canyon because of the simplicity, with a little bit of rocky stairs–just enough that the kids felt like it was more of a true hike than a walk. The canyon is VERY tall and offers some great echo sounds when the birds are flying around. 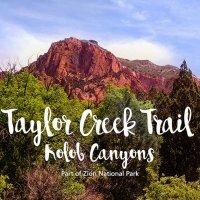 Jenny’s Canyon is the first trail as you enter Snow Canyon State Park. The entrance fee is pretty reasonable; just $6 for the day (per vehicle) or $30 annually. Once you enter the park, drive to the trailhead (not too far up the road). The trailhead will be on the right side of the road. The brochure handed to you at the ranger station entrance tells you this trail is one-half mile. We took the trail to the canyon as well as the overlook called Jenny’s Overlook. My GPS Fitbit tracker entered our adventure as .80 miles and it only took us about 30 minutes. This is with a lot of pausing, picture taking and chatting. Like I said, very easy trail. The big thing to remember is that this trail is CLOSED annually from March 15th to June 1st. Late February and early March are the perfect time to take this trail, although it would be fine in the winter so long as it isn’t too wet. Of course it can be done in the dead of summer, too. The wonderful canyon will bring cooler temperatures and a great place to have a little picnic! This can be a busy trail because of how easy it is with a fun reward at the end. Make sure the kids look UP in the canyon to see any birds that may be starting to nest in late winter/early spring. Once you get the the “end” of the trail, you have the choice to head left in to Jenny’s Canyon or right, up to Jenny’s Overlook. I suggest hitting the canyon first and then coming back to the overlook. The fork is right outside of the canyon. There are larger rock steps you will have to climb; those with severe knee issues (elderly) may not want to do the overlook and this is not a stroller-friendly trail. However, it is by NO means difficult and even the little ones could absolutely walk this with a little help now and then. This picture was taken looking at the canyon from the overlook. It was so fun to watch the birds swing in and out of the canyon as they built their nests. If you listen carefully, you can hear frogs and the bird echoes. Pretty fun! I won’t spoil the overlook with a picture. You will just have to hike this yourself! Don’t forget to spend some time at the Sand Dunes. The sand dunes are just ahead of Jenny’s Canyon trailhead and have flushable toilets! You know the parent in you was excited to hear that! Take exit 6 (Bluff Street). Go north on Bluff Street to the intersection with Snow Canyon Parkway. Turn left onto Snow Canyon Parkway and proceed approximately 3.5 miles and turn right onto Snow Canyon Drive. Follow this road to the south entrance of the park. Take exit 10 (Washington). Turn right off the ramp then an immediate left at the light. Follow this road for approximately 5 miles to the intersection with Bluff Street/ SR-18. Proceed through the light and continue on Snow Canyon Parkway for approximately 3.5 miles and turn right onto Snow Canyon Drive. Follow this road to the south entrance of the park.